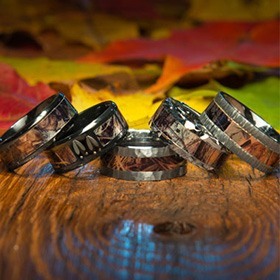 Glow rings, glowing wedding rings that glow in the dark, carbon fiber. Glow rings are totally out of this world! These unique glow in the dark rings have an amazing appeal that’s unlike any traditional ring you’ll find. The bright stripe rings at Titanium-Buzz feature simple, modern shapes that are taken to new levels by advanced glow technology that brings each piece to life. Luminescent material is applied to the exterior and sometimes also to the interior of these glow-in-the-dark rings, which are then fueled by exposure to light. You can use a flashlight to bring the glow to life, or hold the glowing wedding ring up to UV light for even brighter radiance. Our glow technology comes in different colors, so no matter how you want your carbon glow ring to shine, you can find a carbon fiber glow ring that fits your personal style. Glow rings combine several great qualities. Beyond its astonishing glow, you’ll be getting a carbon glow ring that’s made of ultra-durable materials. 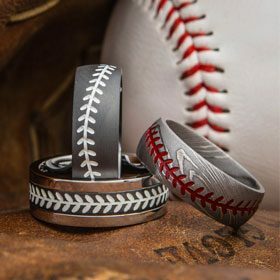 Carbon fiber glow rings resist scratches and scuffs; they’re even coated with an epoxy that cuts down on wear and tear so the glow in the dark rings look shiny and new for years. Carbon fiber is also a lightweight and thin material, so it’s a comfortable band to wear day in and day out. We use a sleek, deep-black variety of carbon fiber that creates a spectacular contrast with the glowing stripes in these glow rings. 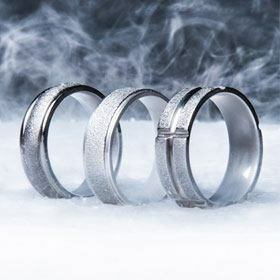 Carbon glow rings clearly have plenty of perks, and one of the biggest is that these glow wedding rings come in a standout selection of stylish options that is lightyears beyond anything you'll find in a traditional ring. 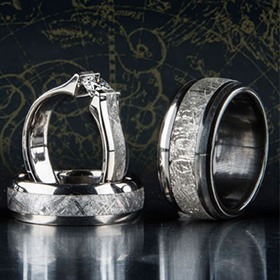 All of our carbon fiber glow ring styles are proudly made in the U.S., and nothing says that your love for each other is always burning like these glowing wedding rings. But even if you’re not getting married or aren't in that kind of relationship, just get one for yourself. These glow-in-the-dark rings are so distinctive and stylish that you’ll still want to wear them every day. This is the jewelry of the future; start shopping for unique glow rings at Titanium-Buzz and find out what you'll be wearing tomorrow.